It is with great pleasure that we that we can announce our pre-order bundles for [The Solution Is The Problem] are now available here! We have a number of bundles…including one with BEER! With OUR name on it! 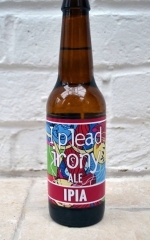 In collaboration with Black Rock Brewery “I Plead Irony Ale” AKA IPIA now exists! A beer so good we put our name on it! So don’t be shy go check out the bundles and grab yourselves a piece of the action now!